Over the Christmas break, I borrowed my sister’s Manu and added pockets to it. It was one of those projects that wasn’t particularly involved, but it was one where I got to a certain point and thought ‘oh, I can’t be bothered with this right now’ and left it for a week (or two or three). 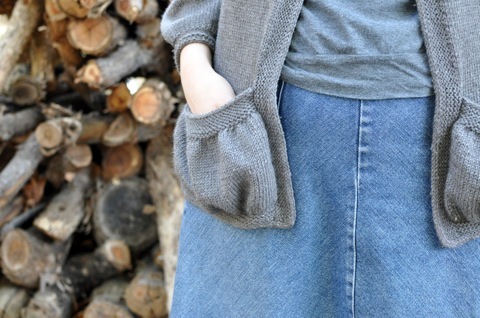 The sticking point was seaming the sides of the pocket flaps to the cardigan. It wasn’t a difficult job, I just couldn’t be bothered dealing with the rigmarole of getting the pockets lined up. Once I got my motivation back, otherwise known as ‘I’m going to see my sister in a couple of days so I’d better get a move on’, it didn’t take long to do at all. But the pockets sans hands don’t really appeal to me at all. A lot of this has to to with the yarn I used. Pear Tree 8ply is 100% wool and doesn’t have much drape. A drapey yarn is recommended in the pattern. 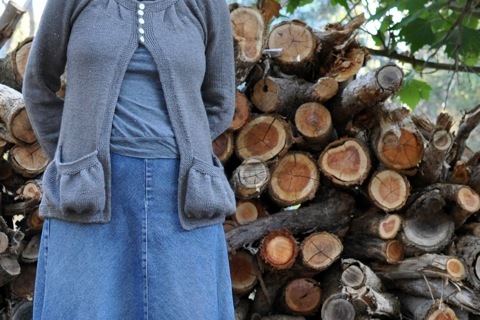 While the more ‘structured’ yarn, for want of a better adjective, worked well for the cardigan itself, it just doesn’t suit the pockets that well. It bulges where a yarn with more drape wouldn’t. I am a bit disappointed, though not surprised, by the outcome. However, my Mum reports that she often sees my sister wearing it, so if the recipient is happy, then I am happy. Mostly. I have high standards for all of my knits as well, especially if they are to be gifted. The manu looks very beautiful though, so you should be proud! I always felt as though the pockets were supposed to look like that. I get what you mean about the different behaviour of the yarns with regard to drape and structure, it can make a real difference. The cardy looks good and if she is happy with it then you have a true success! A happy recipient is the best we can hope for – even when we are not entirely happy. A different yarn may have hung a little differently, but comparing the pics to others in ravely, it’s not obvious. Design-wise I can understand maybe leaving them off (think I would, for me) but I can also see how they balance out the gathering around the top. It’s hard when you make something to give, not to worry about the perceived ‘flaws’, but it sounds like she’s happy. And it’s a beautiful cardigan! yes i think not surprising, but really it looks lovely. and pockets are meant to be able to fit hands in them, so im sure it looks fantastic on her and is practical as well. I think the pockets look lovely. I love a pouchy pocket. Always make me think cozy thoughts.